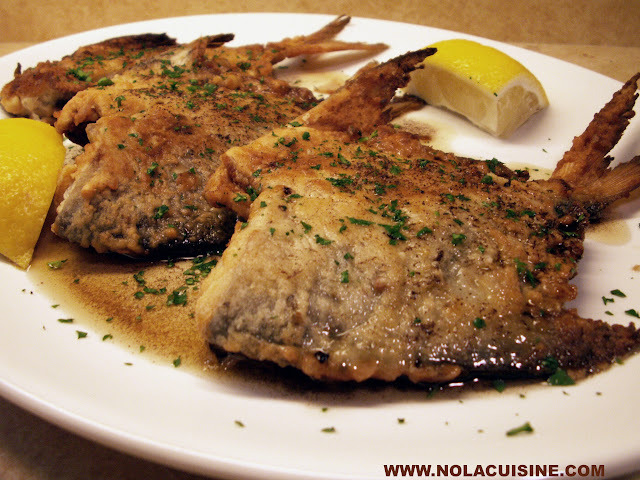 When we returned home from our recent trip to New Orleans I couldn’t get Galatoire’s out of my head, especially the Pompano with Crabmeat Yvonne, although the whole meal was very memorable. By the way, the Galatoire’s Cookbook is phenomenal, an absolute keeper. Their Meuniere Butter is to die for with crabmeat and especially with crabmeat and Pompano, so I decided to search for some Pompano, which I find only very rarely from one source here in Michigan. He didn’t have it but suggested that I try something similar, Pomfret. 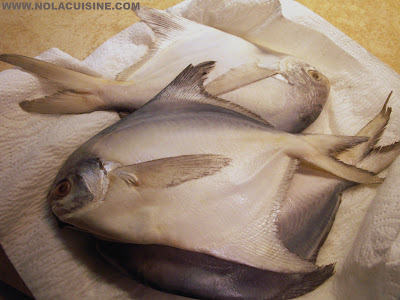 Pomfret, or Butterfish, are in the same family as Pompano, in fact they look like a little Pompano, but you cook them whole; my fish guy suggested Pan Frying, which is what I did, topped with Galatoire’s Style Meuniere Butter (recipe below). A great guy with a great suggestion. 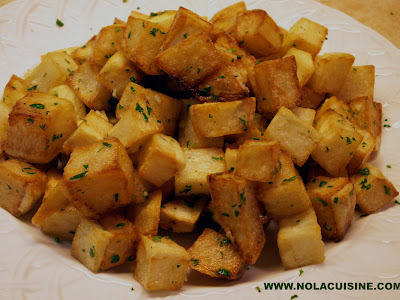 I also served these with Brabant Potatoes, another excellent part of our meal at Galatoire’s. The Pomfret were super fresh and delicious, although not quite Pompano, lacking the sweetness by a bit, but very similar in flavor and texture, while in shrinky-dink size. I cut the heads off for the sake of my wife, who like most Americans, is squeamish about making eye contact with her dinner. I personally like to be able to give my dinner a wink if it tastes good, or the unforgivable Stink Eye if I didn’t care for how it tasted, that’s just me. Combine the flour, salt, cayenne, and black pepper in a bowl. Dredge the prepared Pomfret in the seasoned flour and set aside for 15-20 minutes. In a large Cast Iron Skillet add about 1/2 an inch of oil to the pan, heat over medium flame until a sprinkle of flour flares up and starts to brown. Add the floured Pomfret to the pan, in batches if necessary, so as to not overcrowd the pan. Pan-fry until golden brown on each side and cooked through. Serve on a platter with lemon wedges, and top with the Meuniere Butter (recipe below), garnish with chopped Italian parsley. The flesh flakes away easily from the bones when eating, just use your fork to gently flake it away. In a large sauce pan melt the butter over medium heat, add the salt (if using unsalted butter). Cook the butter, stirring frequently, until the fat is a nice golden brown and the solids just start to brown. Along the way the butter will go through a lot of changes, foaming, etc. When the butter reaches the appropriate color remove from the heat, stand back and very carefully add the juice and vinegar. **WARNING** it will flare up quite violently so make sure you are using a big enough pan! Pour a genourous portion of the Meuniere Butter over the fish, be sure to give it a stir as the dark brown solids contain a lot of the flavor. I can’t wait to make this! I live on the east coast in FL, and my father and I go fishing quite often. We catch Pompano all of the time. Can’t wait to use this great recipe! !